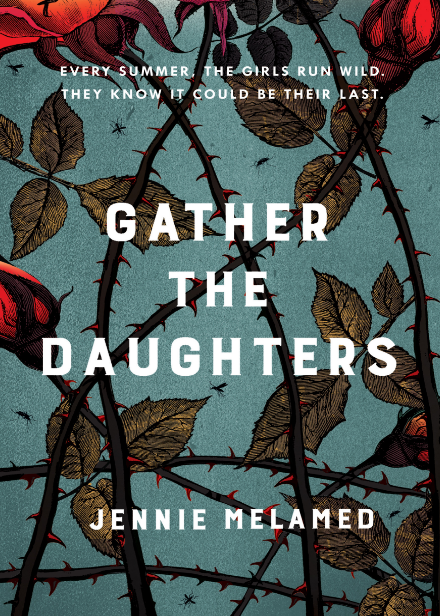 ‘Gather The Daughters’ is the latest book by Jennie Melamed. On a small isolated island, there’s a community that lives by its own rules. Boys grow up knowing they will one day reign inside and outside the home, while girls know they will be married and pregnant within moments of hitting womanhood. But before that time comes, there is an island ritual that offers children an exhilarating reprieve. Every summer they are turned out onto their doorsteps to roam wild: they run, they fight, they sleep on the beach and build camps in trees. They are free. It is at the end of one of these summers, as the first frost laces the ground, that one of the younger girls witnesses something she was never supposed to see. And she returns home, muddy and terrified, clutching in her small hand a truth that could unravel their carefully constructed island world forever. When I started to read this book, I was completely taken aback with it. The cover doesn’t give much away, but I did have an inkling that it was a bit of a dark story. The story is seen from the perspective of four different teenage girls, Janey, Amanda, Vanessa and Caitlin.They are all on the cusp of venturing into womanhood, a new chapter in their lives that none of them want to happen. They all live in a small village, where men are rulers and women are purely created to slave after the men as well as breed. Once, the women begin their periods, they then embark on the Summer of Fruitation, where they are sent off to find a likely match, who they will then marry and have children with. All women long for sons, as they will have a better quality of life than daughters. For years, the women have settled with their tasks and being treated as inferior creatures, but the latest series of girls are unhappy. For such young women, they have seen too much and know that their lives will considerably get worse, if they don’t speak out. Janey, is their leader, she’s fighting against becoming a woman by starving herself. The Wanderers, who are leaders off the town, are wary of the Janey and the girls who have followed her hoping to make better lives for themselves, but as the girls speak out for themselves and refuse to obey their leaders, sinister things begin to happen. The book is very much reminiscent of the 2004 by M. Night Shyamalan called ‘The Village’. It’s set in a rural town, where they live in mud huts, suffer colds and illnesses and technology is a far off thing, but the women are advanced. They know that their lives aren’t right and want to make a change. The story is very atmospheric and eerie, right from the start, with the creepy elders and the strange and dominant rules everyone has to live by or else they will be shamed or suddenly disappear. The perspective of the women was extremely interesting, they all had different background stories but at their very core, they are strong, independent and outspoken women who all know that there is better ways to live. You can buy Gather the Daughters from Amazon and is available to buy from good bookshops. I’m writing on behalf of Jennie Melamed. Thanks for writing about Gather the Daughters. The official website for the book has launched (see “my website), and we linked your article from there. Jennie would of course welcome a link back to her site, when you have a moment. Thank you again for reading, and for your kind words.